Manolo says, in the spirit of the discussion of the sneakers of the old school, the Manolo’s internet friend the Cranky Professor sends the Manolo this note. Yes the Manolo he has seen these shoes, in the stores, and on the feets of the youths. They do not impress the Manolo. Trust the Manolo this faddish version of the classic shoes, it will shortly fade, leaving the Chucks to stand alone as the monument to timelessness they have always been. Happily, on the side of brightness, the Manolo he cannot but believe that the use of the word “deconstructed” in the shoe advertisement signals the final end of the pernicious reign of the Derrida and his toadies! This entry was posted on Wednesday, August 24th, 2005 at 7:33 pm by Manolo the Shoeblogger and is filed under Manolo's Internet Friends, Shoes, Sneakers. You can follow any responses to this entry through the RSS 2.0 feed. Both comments and pings are currently closed. Oh, le Manolo! Apres Jaques, le deluge. Je suis une toadie de M. Derrida . . and a loyal internet friend of the Manolo. Vive le differance. But death to the conversely odd sneaker-sans-lace. While they are not the classic Chuck, my nine year old daughter has these in lime green and they are extremely cute on her. O! Chuck T must be rolling over in his grave. How doooo they stay on? To answer the question of the Zippy “How doooo they stay on?”. It is not obvious? Have you noticed how the youths walk, or should I say “plod along their merry way”. They remind the Raoul of the character Bernie LaPlante, played by the Dustin Hoffman in “Hero”. One drags the foot forward while never allowing the toe of the shoe lose contact with the pavement. Then plops the heal down after only moving the foot no more that 18 inches at a time. Most comical. Not necessarily a Derrida fan myself, but I must say that I fell in love with the Converse (low top with laces) when I was in Padova about twenty years ago as a young girl. How could you not? There were gorgeous, collegiate italianos wearing the Converse of every hue with Invicta backpacks over their shoulders riding their scooters between the piazzas. Aaaayyyyy! 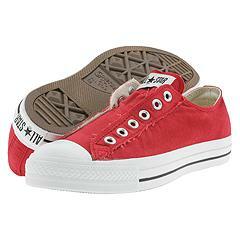 Quakermom’s father wore the All Stars back in the early 60s and the Quakermom wears them now. Soon she will be passing on the family tradition to her two young boys. All Stars without laces? Pathetic and sad – pathetisad. this is why i love reading the manolo! where else can one find advice and commentary on everything from mules to jacques derrida! As a confirmed loather of Jacques Derrida and his toadies too numerous to mention whom I’m forced to endure in academia, I wonder if others share my discomfiture at the substitution of nylon mesh for soft, foot-caressing leather in athletic shoes of other brands besides the Chucks. I’ve been a longtime fan when buying sneaks of the Reebok classic leather casual hightop, which used to come in a dazzling array of happy feminina colors such as soft yellow, turquoise blue, and violet. Now, the leather version is available only in somber black or blinding white–so to buy a pink pair this spring, I had to settle for mesh, with which I’m not entirely happy. Mesh seems affectedly juvenile, in contrast to grown-up leather. What is this with all the mesh? Is it some sort of shoe-world “jouissance” or “vive la differance”? I’m just curious. Tut, tut, Charlotte Allen. We toadies must endure you hipper-than-thou humanitarians, too. Oh, the slings and arrows of academia nuts. Academia Nuts. That’s a good name for a blog (preferably written by a professor from the University of Hawaii). Anyone? I believe that the recent trend toward mesh & other synthetic fabrics for the sporting sneaker is the issue of weight and breathability if & when the sneaker is put to the use it was intended for: running or other sport. There really is nothing quite so fetid as peeling off a pair of sweat-soaked leather shoes after a game of racquetball or a sprint through the park. The mesh, on the other hand, keeps the feets cool and light, allowing for less of the funk, and more of the elegant stride. Ah, very helpful, Clockwork Clementine: a tradeoff of aesthetics for superior science. And I may not be a toadie, SuperMex, but I sure do love “academia nuts”. My daughter, 9 now, LOVES Chucks. I bought her a pink and orange pair, and she has a black pair. I have my own, that are red, white and blue, like the flag. I will never give them up! Derrida is a bore and those Chuck T’s have got to go. I love that we share the same opinions in philosophy and sneakers! These shoes are bad. Here is further reporting. I bought a black pair of these at JC Penny’s simply because they were only 15 dollars and I knew my mother would think they were ugly. (I do too.) No doubt I had a blast at school attracting everyone’s attention to my new silly shoes. They don’t look as bad if you stare at them for a while! And the answer to everyone’s question: They stay on because they are sewn around the three loops on the bottom. (making it tricky to put laces it. I tried, but I got it.) Also, at the top of the tongue there is a bit of elastic. I must say that they grew on me after a while. However, I did buy shoelaces with my favorite cartoon on them. Yes, I’m a dork.